For young adults just starting out, working or non-working individuals honing foundation skills or retirees trying something new, a broad range of life skills, art and fitness classes are available on-site or in the community to fit different needs and goals. Participants receive support both individually and in groups to develop and expand their abilities, explore new horizons and increase personal growth at any stage of life, education or career.  For more information, contact Mark Williams, Associate Director, Community Life Skills, at mwilliams@thearcsf.org, (415) 255-7200 x103. (Above) Arc volunteers, staff and clients on a smart shopping trip in preparation for cooking class.